Privacy is requested, made accessible or obscured, desired, denied, problematized, and its value is questioned constantly and publicly. 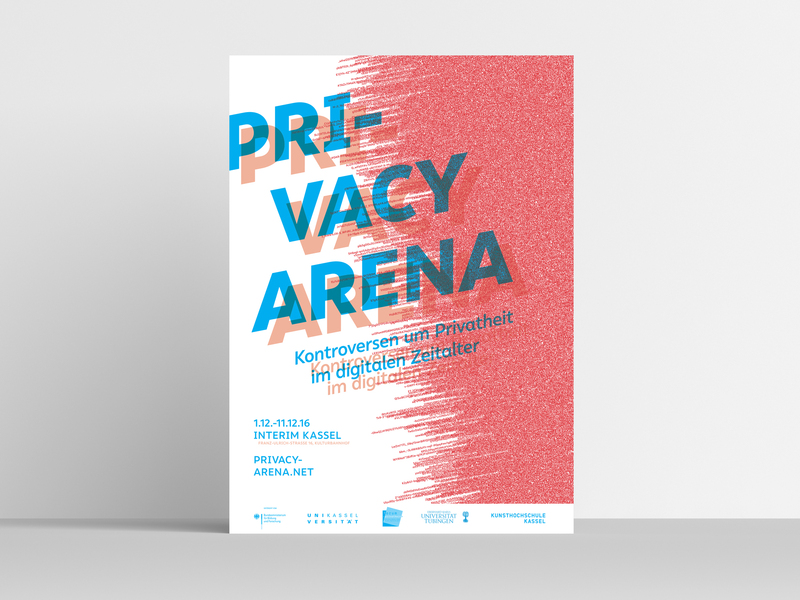 In the project Privacy Arena (2016-17), researchers from the fields of visual communication, sociology, ethics and legal sciences joined their processes and methodologies to investigate how privacy is negotiated in sociotechnologial systems. 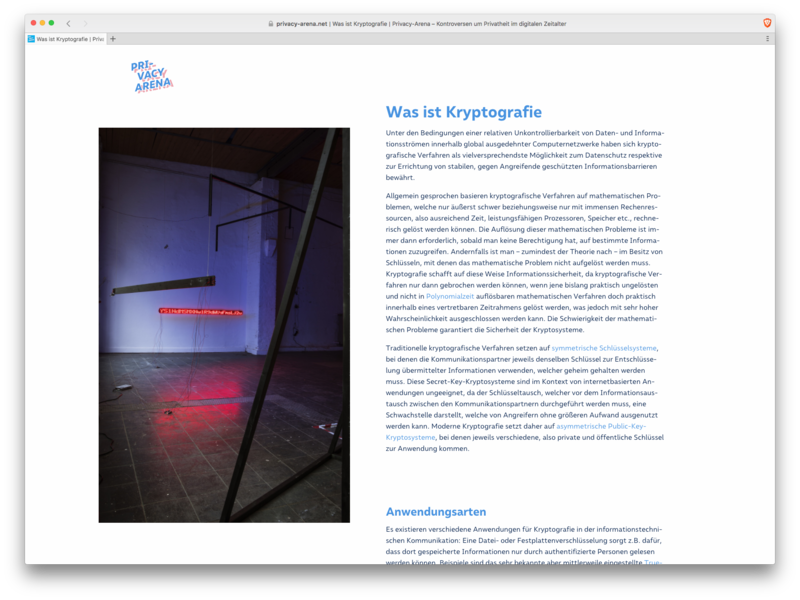 Mike Huntemann, Isabel Paehr and Jörn Röder questioned and playfully reprogrammed/rewired the material conditions of networked technologies to understand how they can be exploited or used in resistant ways. 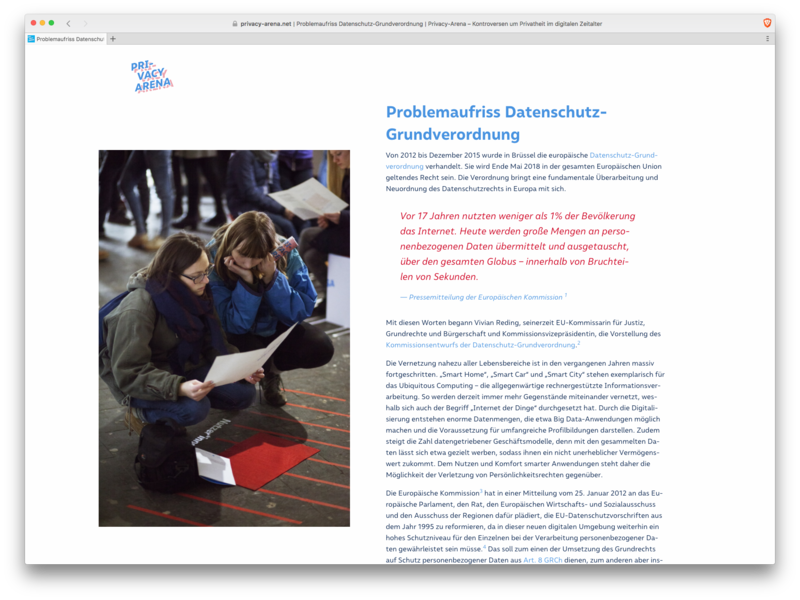 They presented the resulting interactive installations in the exhibition Privacy Arena (Kassel, 2016) and developed a website that informs the public about the group’s interdisciplinary research. 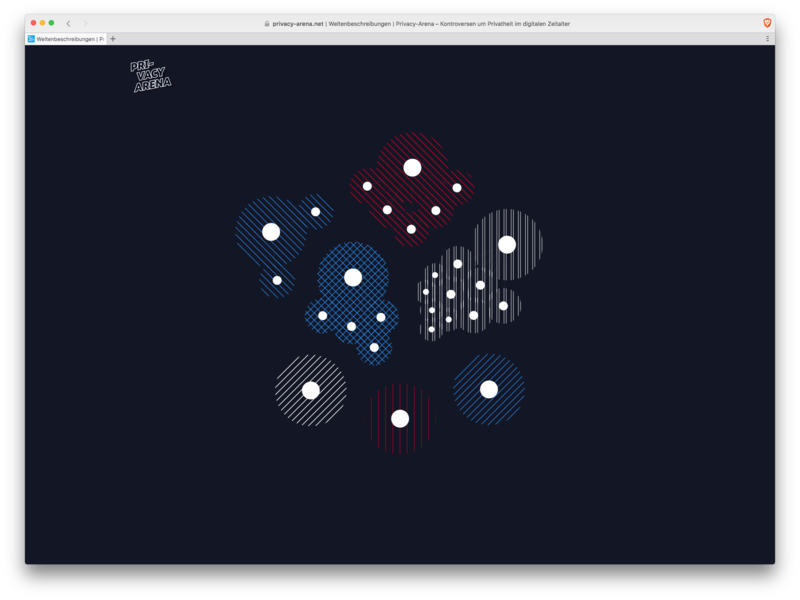 Huntemann, Paehr and Röder review their strategies for challenging the concept of visualization in their text Invisible Machines published by Kassel University Press. The project covered Routing, Cryptography, Big Data, the NSA-Untersuchungsausschuss and the European General Data Protection Regulation as main research themes. 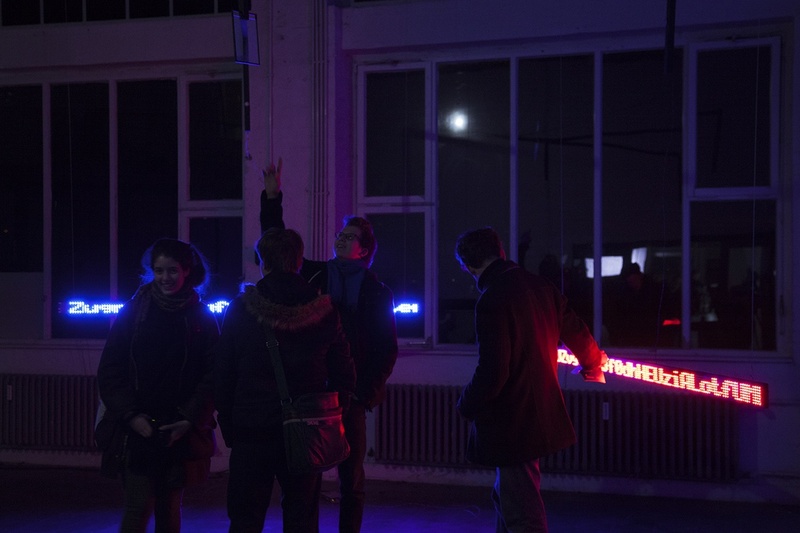 The exhibition took place from 2016-12-01 to 2016-12-11 at Interim, a former warehouse and current art space near Kassel’s main station. 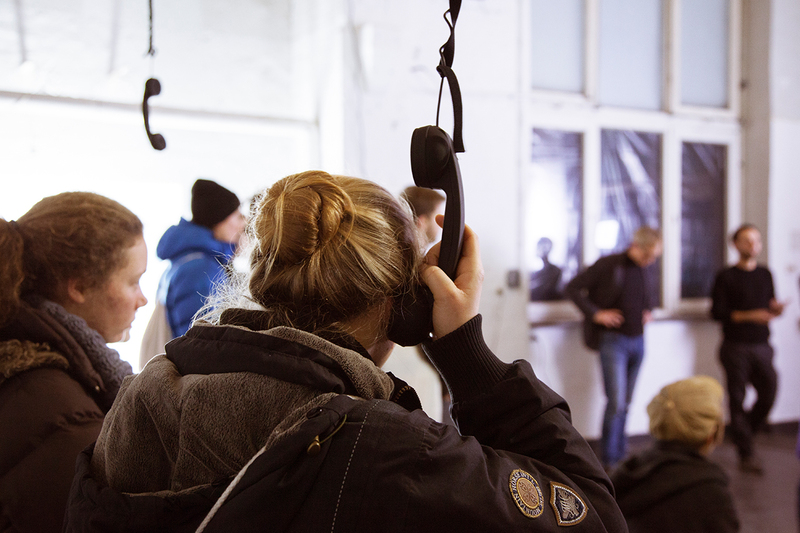 It offered enough space to install five interactive works that visitors engaged with by walking around, touching and scrolling through pages and filmsnippets, making connections, picking things up and finding other people to sit and discuss with. 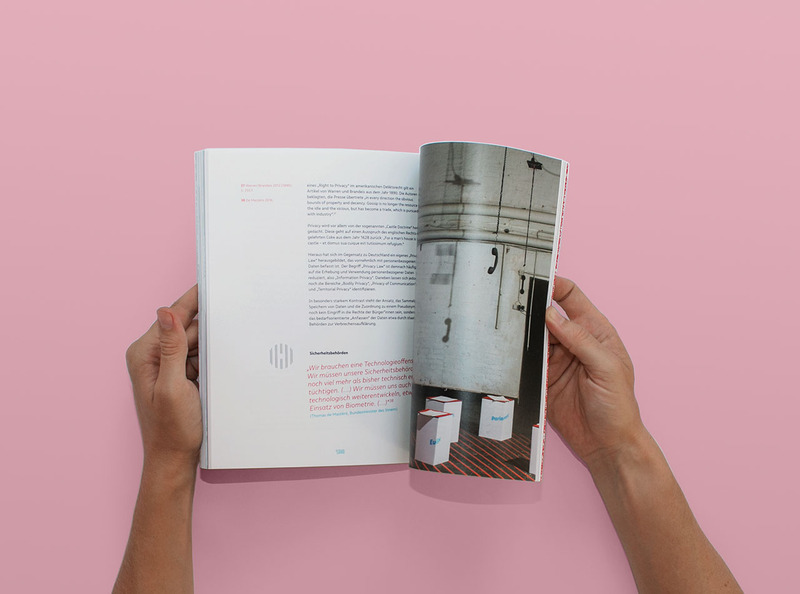 A free catalogue offered comprehensible texts on the research. The installation conncets dots without end and maps internet exchange points in a very fast operating, global network. By not only focusing on the nodes, but also on the lines between them, transnational submarine cables become part of the picture. The installation thus refigures the geographical places involved in the global network. 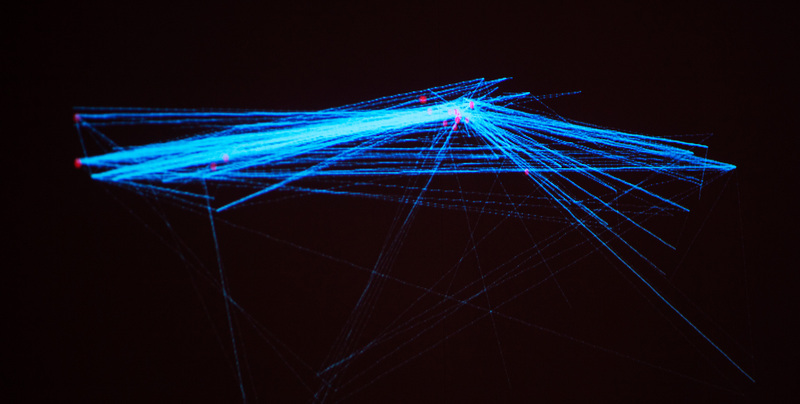 To make encryption tangible, this installation makes use of green laserlight as a visual indicator for message transmissions. A wooden construction in the shape of a Y holds a laser on one end and two lightsensors on the opposing two ends. In between, a prism divides the laser’s light into two light rays, allowing for both sensors to receive light signals. A LED-board is attached to each sensor. A microcontroller is fed with encrypted messages and accordingly produces different patterns of laser light. The sensor the message is meant for has a key to decrypt the encrypted message sent by the laser and displays it on the LED-board connected to it. The other sensor’s LED-board shows ciphertext, because even though the sensor receives the light pulses, it can’t decrypt them. While the prism works as a metaphor for the surveillance program PRISM, encryption as presented in the installation can make intercepted data unreadable for everyone but the intended receivers. This room installation operates in different heights of the exhibition space. Visitors of the exhibition are invited to engage with processes and voices involved in the realization of the European General Data Protection Regulation. Multiple phones hang from the ceiling and ring annoyingly until visitors take action and answer the calls. By pulling the phones down to their ears, they trigger a motion sensor that makes a recorded voice read a quote from one of the politicians, lobbyists, activists and journalists who negotioated and discussed the European General Data Protection Regulation. 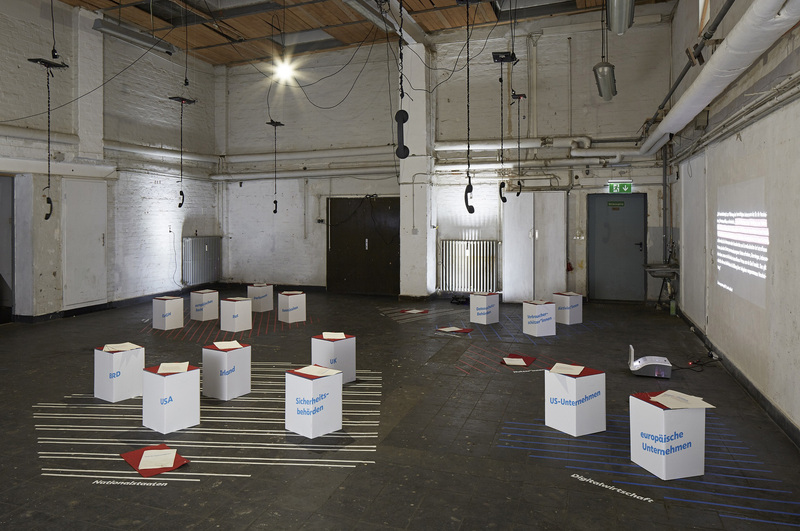 To walk to the phones, visitors enter a sociological map indicated by rasters and lettered stools on the ground. 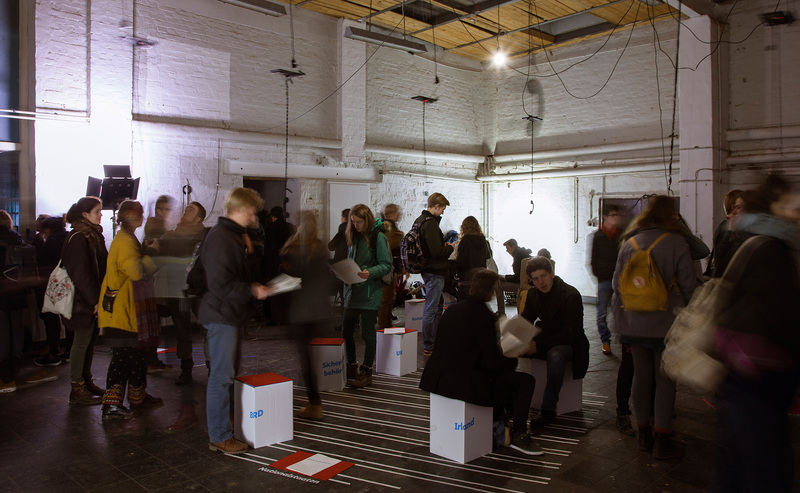 As every stool represents one political actor and comes with a short text, participants do not only position themselves by sitting and reading, but furthermore change standpoints and connect different agencies with their footsteps. On the wall facing the map, a projector shows excerpts of the change requests (Änderungsanträge) political actors submitted during the elaboration of the European General Data Protection Regulation. In the videoloop, visitors see how specific parts of the law were rewritten again and again over time. All change requests are also shown as a paper staple on a pedestal, making visible the amout of paper and weight involved in the making of the regulation. The room installation DataDataData is separated from the viewers by a glass front. They can look inside the ‘black box’, but they can’t enter. In the room, objects that are artefacts of big data are on display: Videos of ship wreckage are undertitled with commercials for cruises. A baseball bat and a balaclava are shown together on one pedestal, because Amazon suggests users often buy them together. On the glass front, names connected to people of color and how Google displays more ads for arrest records when searching for these names, is one example for how biased algorithms criminalize people according to a study by Latanya Sweeney at Harvard University. On the wall facing the viewers, a videoloop contains videosnippets chosen by an algorithm that uses some of the principles of big data algorithms and applies them to video search on Youtube. 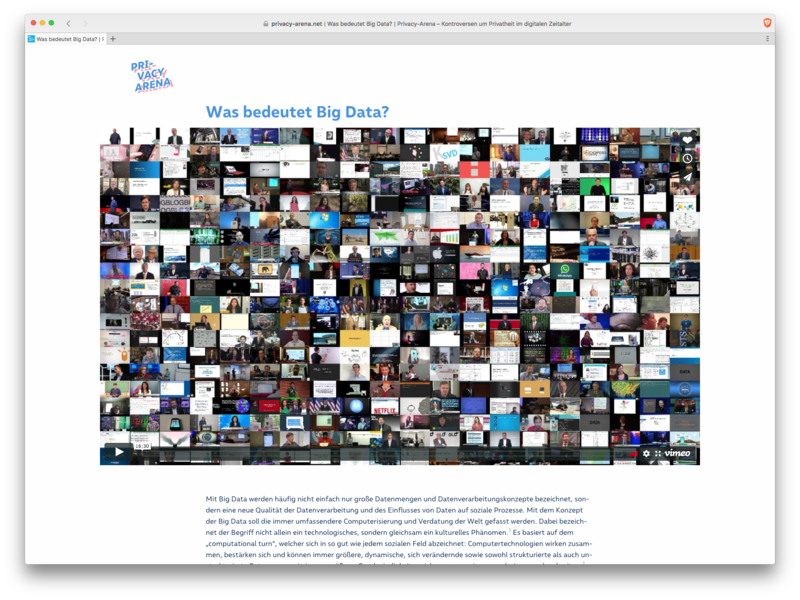 All the snippets contain the term Big Data and are not longer than 3 seconds, making the video an absurd collage of mostly white buisiness men. 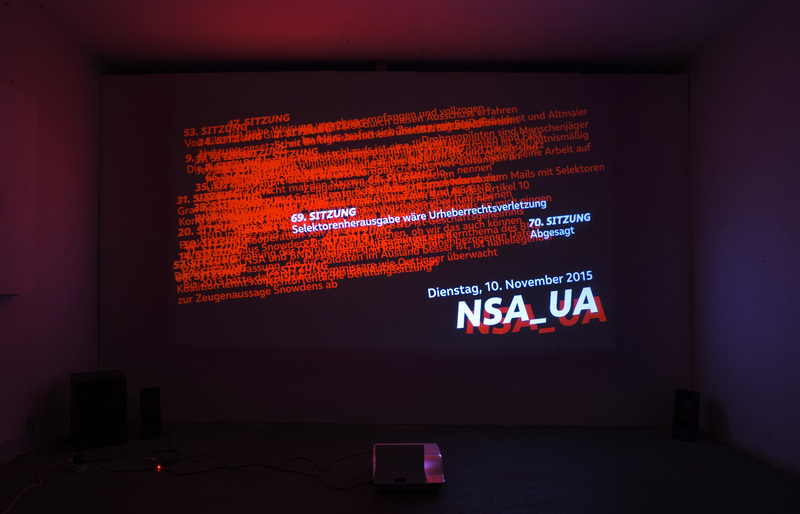 The video and sound installation NSA_UA remixes voices and protocols. Excerpts from the discussions in and of the German Parliamentary Committee investigating the NSA spying scandal (NSA-Untersuchungsausschuss) after the revelations of Edward Snowden, are used as cues. 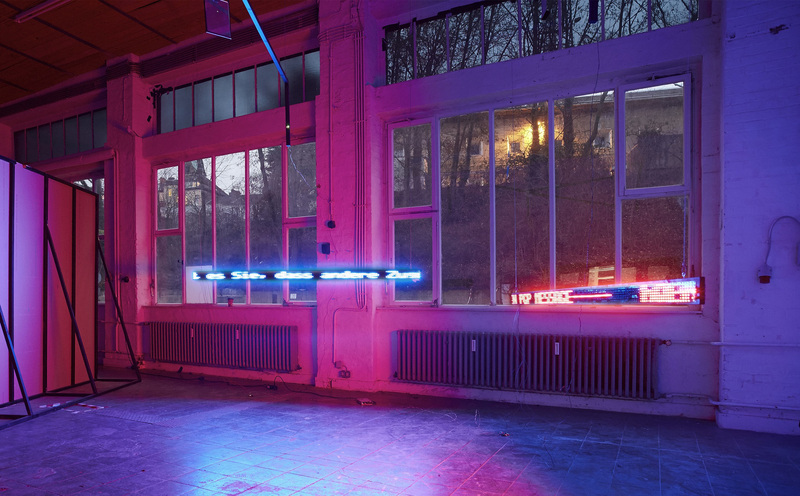 By converting text snippets into rhythms and visual clockings, the installation facilitates visitors to follow political developments over time. All visual materials use blue und red as key colors. Depending on the context, the designs cope with complexity or support easy access by following confirmable rules and styles. Interference patterns created with PGP overlap the title Privacy Arena and confront readers with difficulty while reading, thereby referencing the complexity of conflicted arguments and technological nestings. 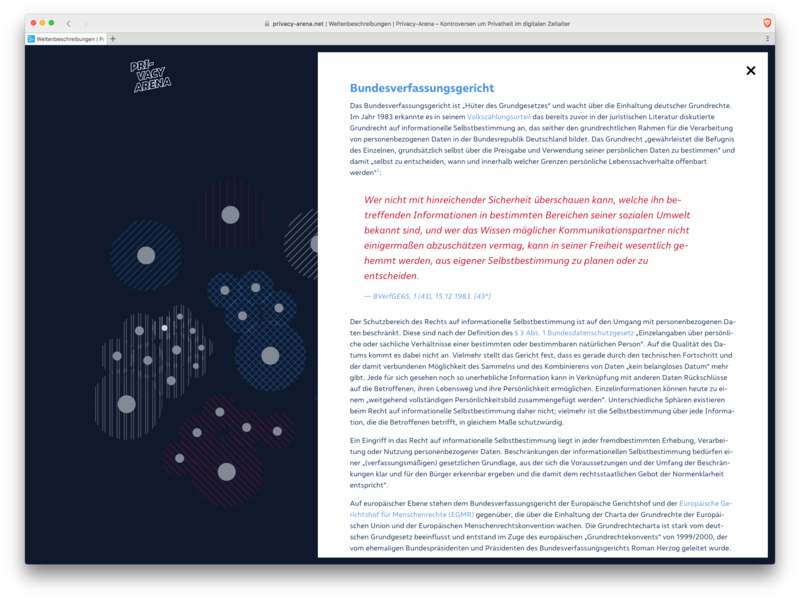 On the other hand, texts in the catalogue and the website are structured comprehensably by the choice of fontweight, size and color. 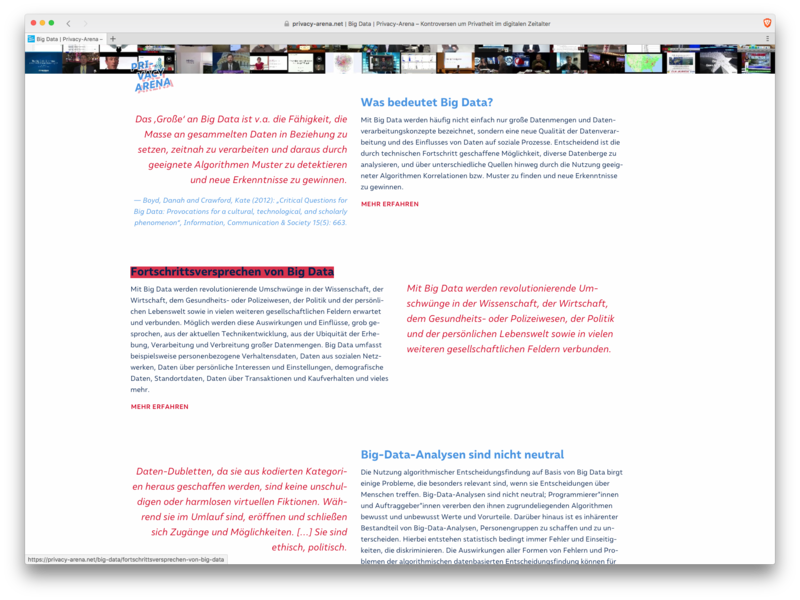 The website privacy-arena.net condenses the group’s research by providing readers with informative texts in different lengths and depths. Interactive graphics help visitors to understand the manifold standpoints and social relations invested in defining privacy for various purposes. 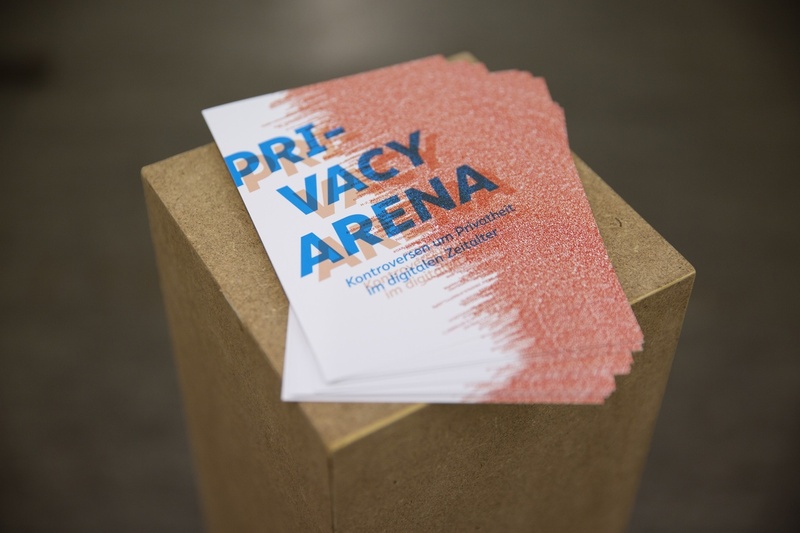 Kassel University Press published the book Privacy Arena that Britta Wagemann designed based on the project’s visual identity. In their contribution Invisible Machines, Huntemann, Paehr and Röder propose permeability as a term and practice that goes further than transparency. We chose permeability as a design strategy with the aim of not finding one unifying visual truth but rather the possibility of a network in which meaning would be generated instead of reinstanciated.